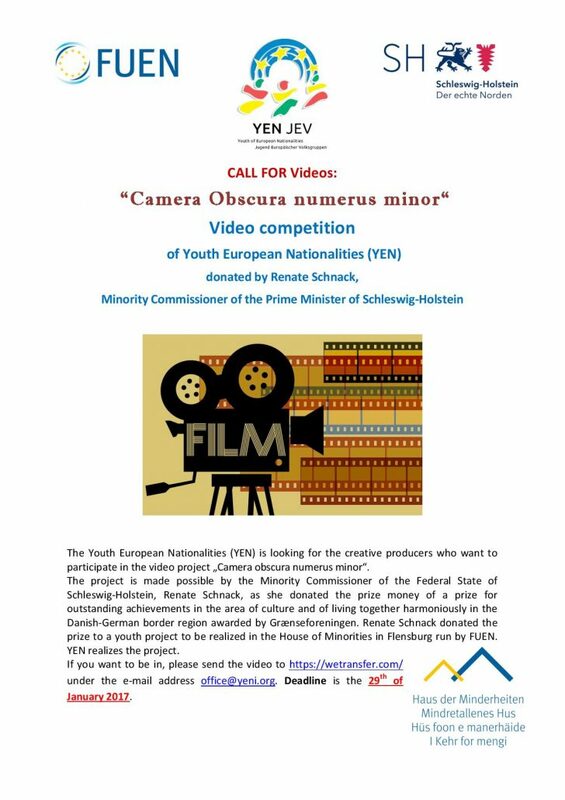 We are looking for creative producers who want to participate in the video project „Camera obscura numerus minor“. The project is made possible by the Minority Commissioner of the Federal State of Schleswig-Holstein, Renate Schnack, as she donated the prize money of a prize for outstanding achievements in the area of culture and of living together harmoniously in the Danish-German border region awarded by Grænseforeningen. 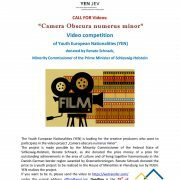 Renate Schnack donated the prize to a youth project to be realized in the House of Minorities in Flensburg run by FUEN and asked YEN to organise it. The first three places will be awarded with prize money of 300, 200 and 100 Euro. Afterwards, they are invited to receive the prize as part of the planned activity in the House of Minorities and spend a weekend i Flensburg, Germany. Join the Project! We are looking forward to your participation!